I am Dr.Gaurav Roy a dentist from Mumbai, India. 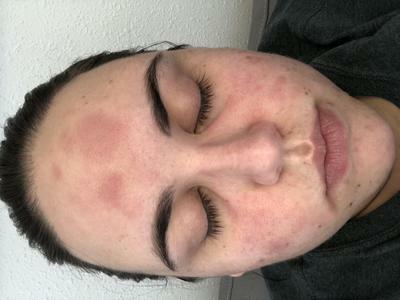 I have a chronic skin rash on face problem for the last three years. The problem however has worsened over these three years. After every shave the rash can be seen. The skin becomes inflamed and there are tiny postules which can be clearly seen. Its a kind of delayed response. The worst effects are seen on the second day since the last shave. Now the skin in the affected area has become slightly dark and looks ugly. The area is a localised area on the left cheek only. I have slight beard growth on my cheek, so I have to shave there. The skin on my cheek has become very highly sensitive. In fact I have now developed a phobia from shaving and avoid it as much as possible. There are no such signs on any other skin area of the face that is shaved. My health is decent with no other systemic problems present. Kindly guide me with the diagnosis and the treatment plan which I should pursue for this rash on face. I have tried every thing from changing my blade, after shave lotion, shaving cream but its of no help so far. I am 15 years old and a few weeks ago very tiny spots around my mouth, nose, and a few on my eyelids and eyebrows appeared. They were quite hard to notice unless viewed under a strong light where you could see blatant bumps on my skin. I went away on a holiday to Africa for two weeks and this skin rash on face seemed to clear, but now I have come back and this facial rash has come back again, only less bumpier than before but more itchy and dry. I keep constantly moisturizing the affected skin on my face but I do not know if it is doing more harm than good. It is very uncomfortable, especially on my chin where it is very itchy at the moment and my skin seems very stiff. Over the years I have noticed a facial redness rash that would come and go. More recent though it seems the facial redness stays and intensifies when I go outside. I sometimes feel like the area on my cheeks close to my nose have a slight stinging sensation. When I say sensation I mean its just a feeling nothing aggravates it, like touching or washing, etc. I have been experiencing feelings of just not feeling well overall. The best way I can describe it is how one feels at the begining of getting ill but only nothing sets in. Sometimes I experience flu-like symptoms with body ache along with that. I have talked with my doctor about this numerous times but it is as if she is brushing it off. About a week ago I had a visit with her because the gland on the left side of my neck swelled and I had pain with intermittent elevated temperature. I experienced no other symptoms but that. She diagnosed a low grade infection and prescribed antibiotics. The day I was in her office I noticed my face, arms and chest were beet red. The only thing I did that day was go from my house to the car, stopped at the ATM and straight to the doctor which in all was a 10 minute drive. I had been experiencing continual facial redness but on this day it was worse. I was red on cheeks, nose, down onto chin, and over the eyebrows. No redness in creases or around the mouth. When I look closely the pores closest to my nose looked inflamed compared to the rest of my face. The doctor chalked this off as me being fair skinned. I tried to explain that I have had the same skin all of my life and never have I been red like this. The color of red I am referring to was kind of like fire engine red. Well maybe not as dark. The redness on my face other than near the nose pretty much looks like a sunburn. How can this be when I was in a car with the air conditioning running. My doctor did say it didn't look like Rosacea. All I know is the exposed skin on my body was red: face, chest and arms. Five days later and still red just not beet red. It does sound a lot like Rosacea. I've had rosacea for a couple of years now. During summer months it seems to get worst because the sun is so intense and the heat. If I eat spicy food or have a glass of wine it comes out more but not all the time. I have to be carefull on what makeup and lotions I use on my face. I have to say MaryKay is the best product out there. For the past 7 years, I have been dealing with outbreaks of circular raised rashes on my face. They are very itchy. They look a lot like a ringworm type rash, but the treatments for ringworm do not work on these rashes. I've had several biopsys. The final diagnosis was Follicular Mucinosis. What causes this type of rash on face? Will it ever go away? 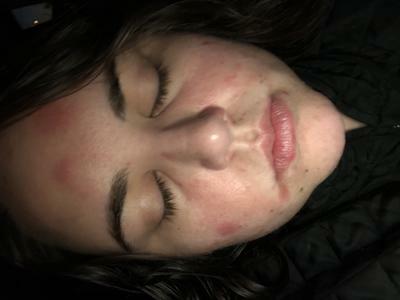 What can I do to prevent these facial rash outbreaks? The other day between my nose and lip swelled up and then my cheeks, chin and around my lips broke out with tons of tiny little white heads and this rash on face burns really bad. I put Calamine lotion on the facial rash today and it is helping. My two year old daughter broke out with about 10 white bumps on the right side of her forehead and arm and we were both feeling very tired yesterday and today. I have a 7 year old daugther who has no symptoms. We all live with my parents and brother and they have no symptoms either. We all eat and live in the same areas use the same products, but my daughter and I sleep in the same bed. I have had a rash appear on my face starting just about a month ago. It was on the bottom of my chin in the beginning. Then it moved to just below my bottom lip. Now it is on the corners of my mouth and below my nose. It causes my skin to itch and peel. Lotion does not help the dryness and it burns when I apply it. It lasts about 2 weeks in one spot before it completely moves to another spot on my face. At first I thought it was my fiance's stubble of hair on his chin from when he kissed me. Then I changed my make-up brush and pads to see if this would help. None of these seem to have an effect when changed. This is very humiliating and keeps me from going out in public. My fiance is a football and basketball coach. It has kept me from attending Christmas parties as well as his games. I need help! I used to get it like that as a child. Go to a chemist or a health food shop. Get COMBINATION D. THEY ARE TISSUE SALTS. Take 3 under your tongue to dissolve (it takes awhile) every 3 hours. Also crush 2 up, add a couple drops of water to make a paste and spread it on the affected area. Do it for at least a week and it should clear up. I had it for years and tried creams and other stuff until I found this. I have never had it since. About a month ago, I thought I just had an outbreak of spots but now realise that it is a rash. It does not itch or hurt but is really red and blotchy. It looks like little blisters but there is nothing in them. I have tried loads to get rid of it but to no avail - can anyone suggest what it may be? I also have the same type of rash on my chin below my lip. It's not itchy or painful. Small red area, keeps growing, little pustules but they don't break open. I went to a dermatologist and she thought it was an oral herpes outbreak, but it doesn't act, look or feel like one. I get cold sores in my mouth, and this isn't anything like that. I got a high fever after getting a flu and pneumonia shot and I'm wondering if this has anything to do with it. Has anyone found out what it is, or what treatment works? What type of steroid cream did you use? Thanks! I have the same thing, but it doesn't look like blisters. I have applied a steroid cream. The cream helps temporarily and then the rash comes back. If you find out what it is let me know and I will do the same. I have had a cold sore for two weeks at the corner of my mouth. I woke up this morning and that side of my chin is very painful to touch and a small rash under my skin has appeared? Finally, a rash on the chin may mean something else is going on such as a dental problem, especially since it is painful to touch. If the rash persists, a visit to your doctor might be a good idea, especially if you are sure that the other possibilities mentioned above are not responsible for the cold sore rash at the corner of your mouth. My face gets hot and tingly, then this sudden skin rash goes real red, goes down my neck and all over my body. It feels like a sunburn, lasts about an hour and then goes away. It's happened three times in the last two weeks. I wasn't eating one time that the sudden skin rash appeared and the other two times the sudden sunburn type skin rash appeared I had eaten a couple of hours before, but not the same foods. I've had a ringing in my ear for about two months, and the doctor says I have a plugged tube in one ear. I purchased a second computer for my home office a month ago and my wife thinks I'm getting the rash from to much computer use. The doctor doesn't think so. I would appreciate your input. TRY PURE COCONUT OIL. IT CURES A LOT OF SKIN PROBLEMS. It comes in tablet form and also oil in a container - solid or liquid. It depends on the temperature you store it at. I too have been having this type of rash. It seems to show up every two to three weeks. My face all of a sudden gets red, hot and feels like it is burning. It started at the end of August and is happening, like I said, every few weeks. But today is the worst reaction I have had. It started on the face, moved down my neck and arms, and then to my chest and back. The thing is, it only lasts about half an hour then the rash disappears. Today though I just do not feel Like myself. My face still feels like it is burning, but no viable rash is present. I did make an appointment with a doctor, but cannot get in until next week. This rash has appeared once a month consistently for five months now. It is around the time of my cycle when I notice it flaring up. Sometimes it will last anywhere from three to five days, but this last one was only two day. It itches pretty bad at random times. Benadryl does not seem to help. I have gone to the doctor to finally get blood work done, and he suggested it was a potential Malar rash. I am not sure what it is, but it is getting tiresome having it monthly.